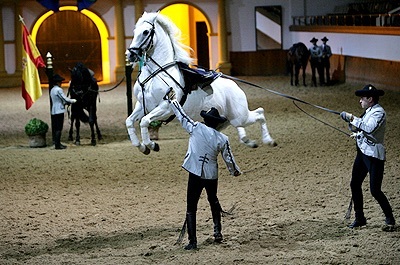 Jerez de la Frontera is the capital of Sherry production and it is also famous for its Andalusian Equestrian School. It is just a bit farther south than Doñana Park, which we visited yesterday. We purchased our tickets online and we leave early so we will arrive in lots of time for the 12:00 show. We arrived early, and found parking which is always a challenge in Spanish cities, thanks to the wonderful GPS capabilities of our iPad. It has paid for itself many times over this trip. I have no idea how we managed to travel in Australia and New Zealand without it, only relying on maps. Never again! 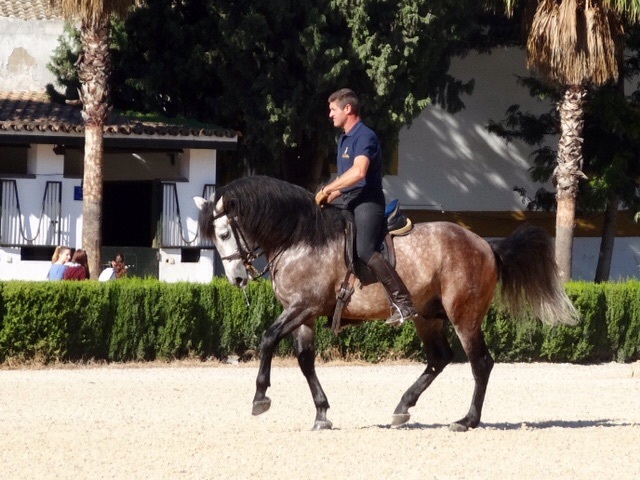 We watch a very good short movie about the history of the Andalusian horse and then we have time to watch some of the training in the outside riding ring while we have our lunch. We were sitting in the front row on the right side, almost in line with the dark grey horse in the photo below. Fantastic seats! Well worth the extra 6€ For preferential seating. 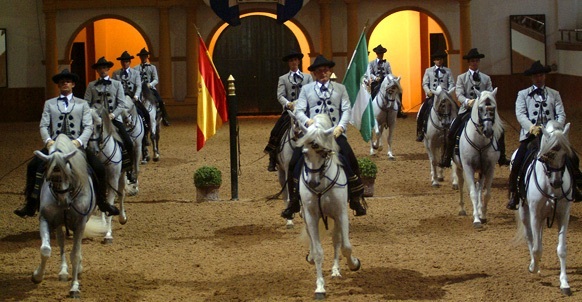 I found this short video which shows parts of the same show we saw and it is on location at the school arena in Jerez. The show was wonderful and it had enough variety for Bob, who doesn’t love all things horses quite as much as I do. I did try to draw a bit during the show, but it was hard to concentrate on drawing and what was going on, and of course the horses never stood still! 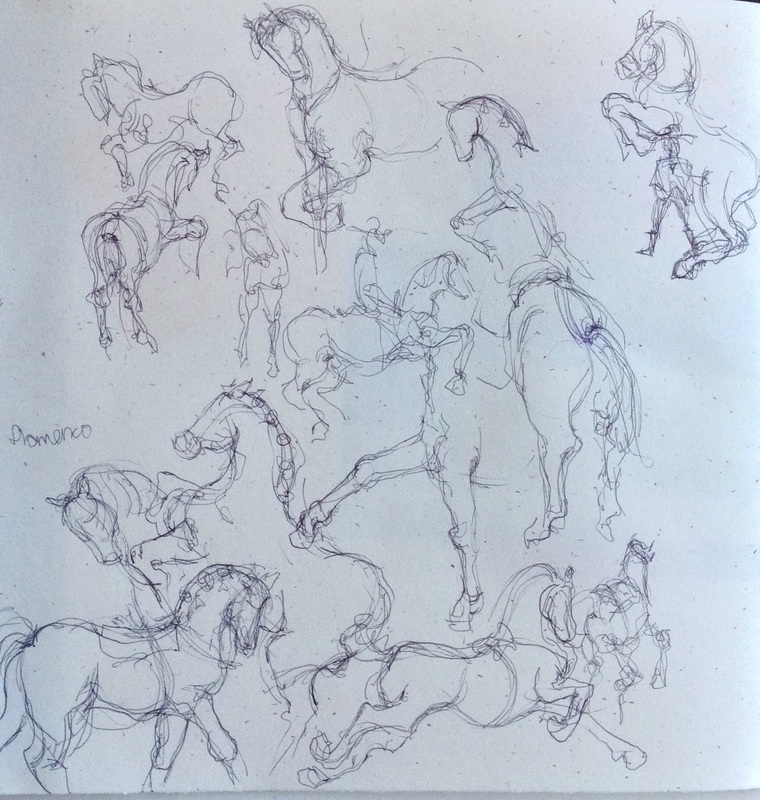 Here is my page of horse life drawings. The young lady sitting next to me was from Germany. 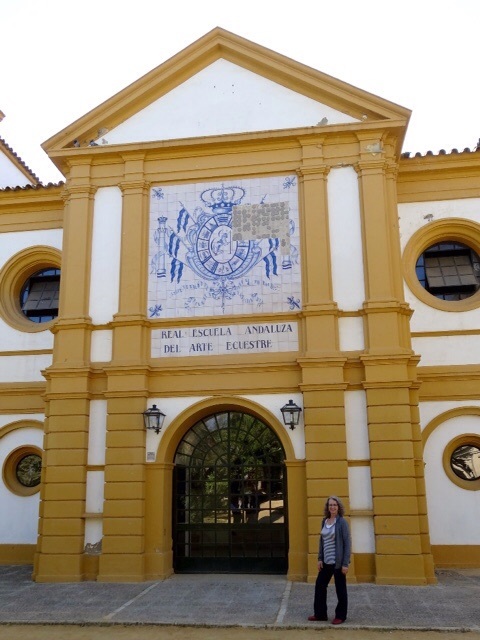 She owned a three year old Andalusian mare and she was hoping to be able to come to this school for riding lessons. A ten day course is 2500€ and room and board is not included. 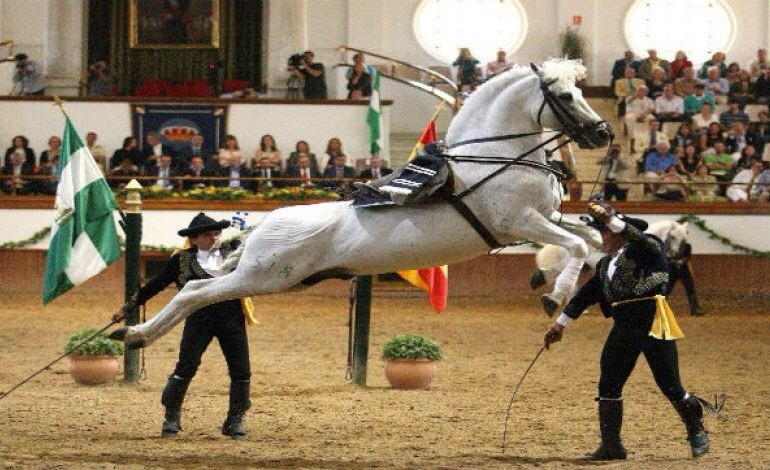 Expensive, but how fantastic would that be, to ride these beautiful well trained Andalusian horses, the same ones that take part in the shows! The lessons run for six hours a day, so you would certainly have to be fit. 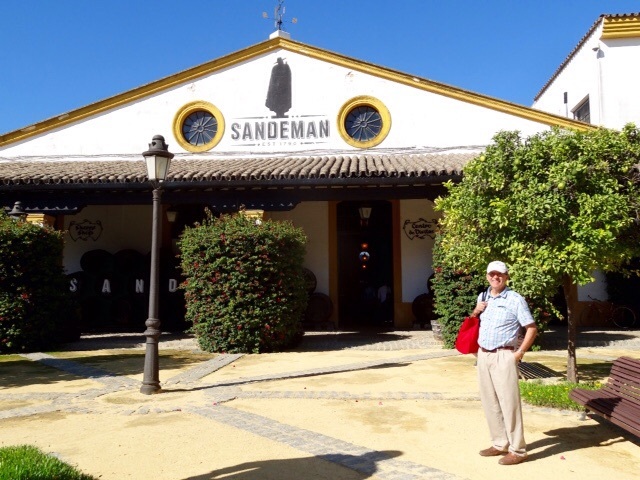 After the show we walked over to one of the many wineries in Jerez, the Sandeman Bodega, for a tour and tasting. 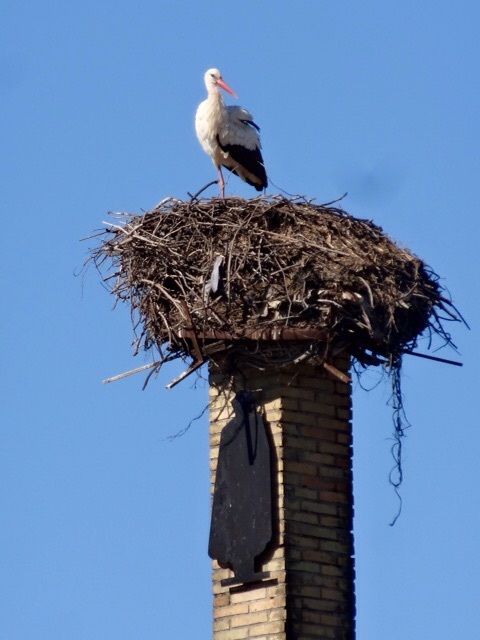 They have several resident storks, and we were lucky enough to see this fine fellow. 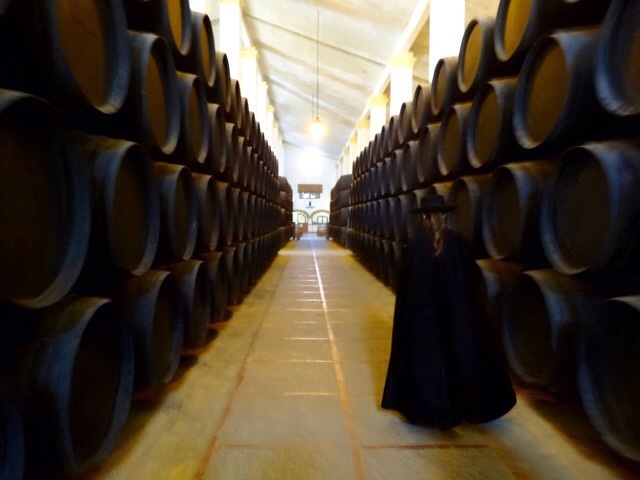 Our guide in costume walking past some of the barrels full of Sherry. 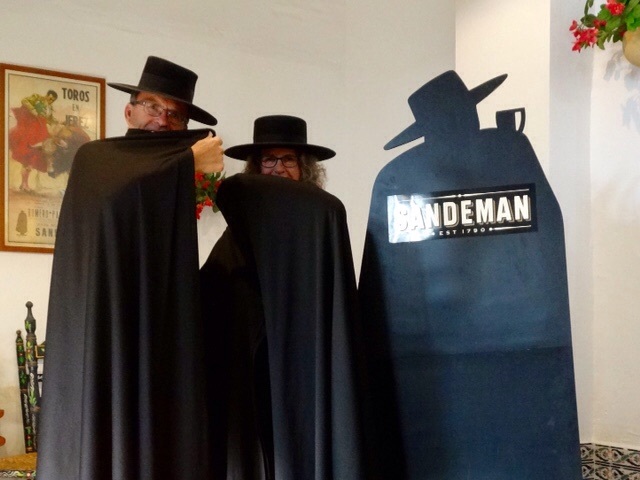 After three ‘very generous’ samples of sherry we played Sandeman! 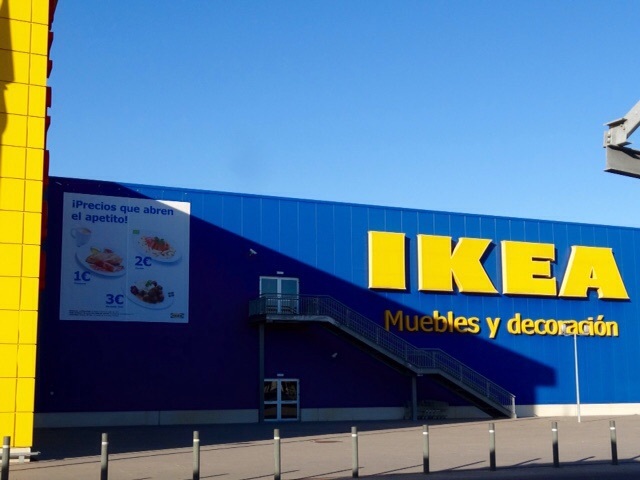 Finding washrooms is always a bit of a challenge when travelling, so we stopped at a nearby Ikea to use theirs before the trip back to Seville. It was rather strange to find that it laid out exactly like the one back home. We felt like we were back in Edmonton!